Artisan Profile: Bua Bhat "Learned Weaving by Ear"
Her showroom was a delight in color, creativity, and calm. The moment I met Wilai she put me at ease with her twinkling eyes and warmth. I recently came back from an extraordinary three month overseas journey in Southeast Asia and Northeast India. Part of the adventure was connecting with artisan groups, learning about their work, and beginning to source an initial collection for my social business, Indigo Lion Global Handmade. In the coming weeks I will be sharing a series of reflections, experiences, and beautiful conversations from my trip. This is the first one. 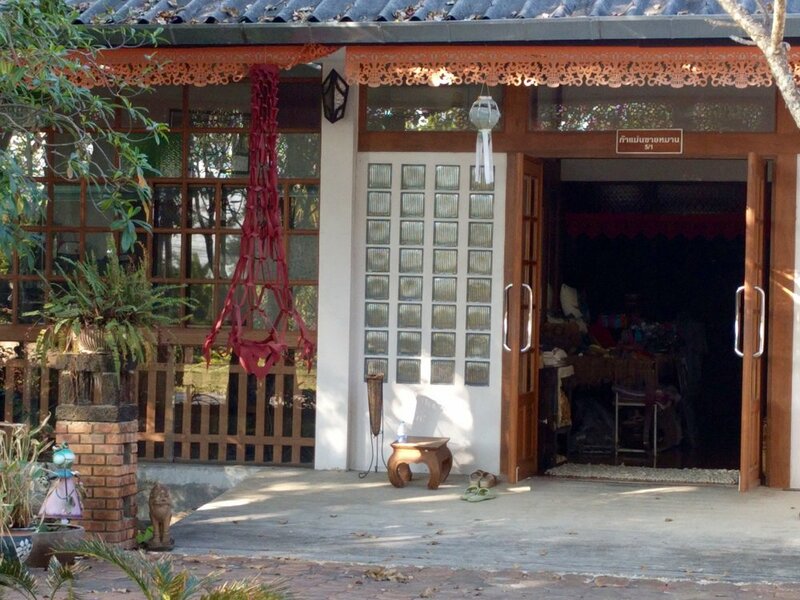 We were just getting our bearings in Chiang Mai, Thailand when I reach out by email to thefounder and creative force behind Bua Bhat, Wilai Pichitkanjanakul, a small manufacturing workshop which makes handcrafted contemporary hook weaving home decor. I introduced myself, Indigo Lion Artisan Boutique, and requested a visit. She replied immediately and a date and time was set. I was nervous. I had to recognize that my nervousness about the whole meeting had much to do about me following through on the thing I’d been saying I was going to do on this trip: meeting artisan groups. This was the first one but what was at stake felt bigger: “I’m Actually Doing This.” The flurry in my stomach let me know that I’m actually launching my business. This is it. This is the real tangible beginning of it, right here. To calm my nerves I prepared for the meeting. I reread material that I had written about Indigo Lion for this trip, so I could somehow memorize all those well-crafted words… you know, just in case I forgot how to speak or something. I searched everything online about Bua Bhat and Wilai. I reached out to my business coach. Brittany reminded me to “just have tea”, a way of saying to slow down, just get to know someone first, and learn from the experience. Glancing around when we arrived, her showroom was a delight in color, creativity, and calm. The moment I met Wilai she put me at ease with by her twinkling eyes and warmth. She invited us to sit down and our conversation began as she shared the story of her family, her life in textiles and the vision of Bua Bhat. Her father, originally from China, was invited by the Thai government many years ago to teach weaving techniques to the Thai people to work in textiles. In Lumphun Province, where Bua Bhat is located, there are many groups of the Thai Yong tribe. This tribe was originally from China and weaving was essential to their culture. It was said a young woman can’t marry until she proves she can weave. Although they don’t practice this much anymore, she says they are good with their hands and learn her techniques quickly and well working at Bua Bhat. Wilai says she “learned weaving by ear”. Since she was the sixth child, by the time she was old enough to learn weaving, her father has by then stopped teaching. She heard his stories about how to weave but was never formally trained. She thinks this has freed her to be more creative in her technique, being largely self-taught and learned by doing. 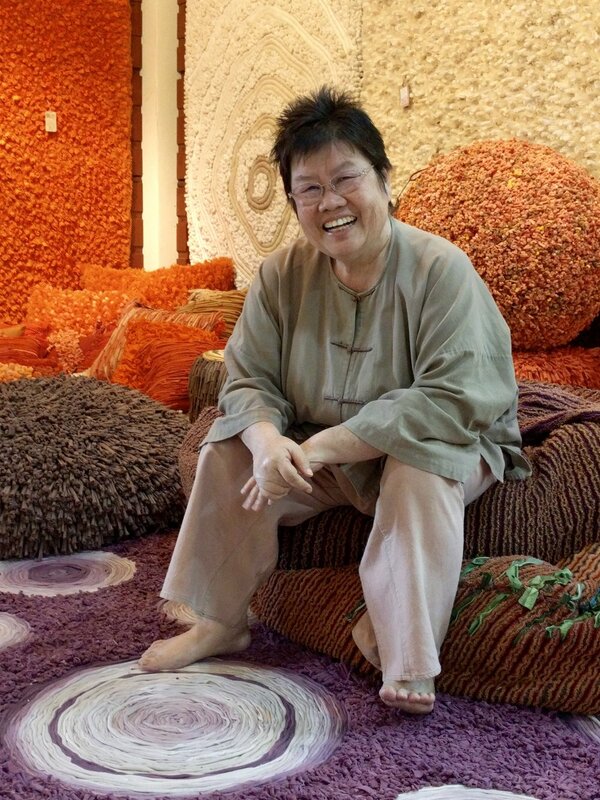 Her textile creations take the form of pillows, cushions, rugs, and bedspreads and a few smaller products such as pouches and handbags. It was an American weaving company who invited her to see their workshop because they wanted her to produce for them. They introduced her to the Swedish technique of weaving with the fabric scraps, which has now become part of her signature. The hardest part when she was getting started was how to get the scraps from big garment manufacturing companies. It’s now her golden secret, also creating and inventing her own tools to work with her techniques for her designs. I asked her what inspired her designs. “What fabrics can do and what dyes can do,” was her reply. While nature seems to play strongly in her work - pebbles, rivers, and waterfalls are apparent, for example, it is not a defining influence. The pebble pillow is a great story. 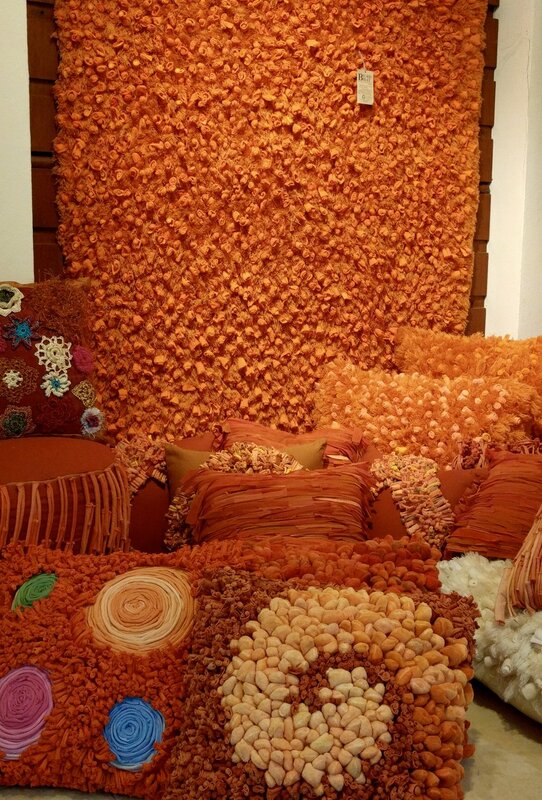 An American customer had asked if she could make pebbles out of the fabric scraps. She said yes, without knowing how. Yet. An experimenter and entrepreneur at heart, she collected a handful of river stones and really started to look at the color of the pebbles at first, because the color is the easiest thing we can see, she said. Then she placed them in a bowl of water near her bed. She left them there for a month to take in the colors, the shapes. Then she began to experiment with the fabrics and shapes they could make, and the dyes and the range of colors they could produce. It took her a year of trial and error for her to master it. It’s now one of her biggest hits. She has continued the work of her father, but in her own way. Confident in her designs and the quality of her work, but confessing to not having any money and not knowing how to do it, she launched Bua Bhat in her late thirties. Her and her business has been quite successful since with international buyers, winning awards and being the beneficiary of several initiatives, including inclusion on the richly informative website, Handmade Chiang Mai sponsored by the British Council). Wilai stressed that if she were to write her own story, she would focus on three things: the fabric, the dyes, and the people. “Without them, I cannot do anything.” Employing women of the Yong tribe, she encourages them to innovate on her designs and techniques and to teach each other what they know. This way the process continues and is sustained. Many are farmers who earn supplemental income working at Bua Bhat. Others take the work home so they can also care for their families. And the meaning of Bua Bhat? Sunflower. Her mother’s name. Her father, whose name in Chinese means “light from far away", had once told her mother “I want to own a shop and name it after you because I love you.” And so Wilai has. An hour and a half passed, my nerves long replaced by taking in all that she was sharing of her story and feeling such gratitude to Wilai. Elation followed when I had a chance to see more of her incredible designs! As I continue to meet other people and artisan groups in my travels in Southeast Asia, I am reminded of what brings us together - a connection to beautifully handcrafted work and the conversations that unfold.